It's finally X'mas.Actually,I thought it was going to be just like a normal day. I started my day with washing clothes...it already took me half a day to finish. Then I went to the hospital with my family coz my lil bro got sick. 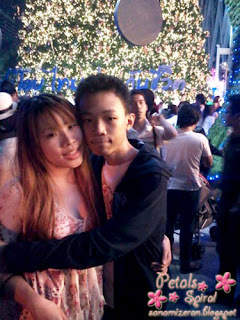 It was all boring until we decided to go to Central World coz my mom was around there. 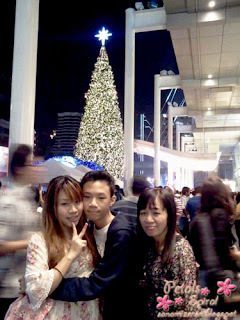 Yeah,I had to admit that I forgot that ppl always go to CTW to celebrate X'mas and New Year. Never mind,we just continued on and finally met up with my mom. She wanted to have dinner there so we ate at ummm...street restaurant?I'd better call it food shop on the street. 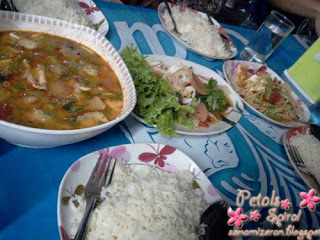 Tom Yum Kung ,seafood sour salad,Som Tam with salty egg. I suggest that you should try one if you have a chance. 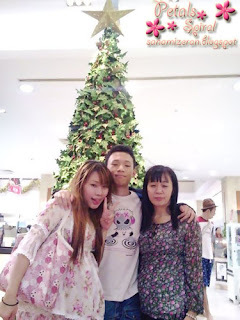 After the dinner we just took some pics of out X'mas memories. Sadly,we had to go home early coz my brother hasn't finish his homework. ...he doesn't have any X'mas long holiday coz of the flood,poor guy. Anyway,here are some pics we took before going home.